Along with his 11-year-old son, Victor Cannon III, the duo participated in the National PLAY (Promoting a Lifetime of Activity for Youth) Campaign started by the Professional Baseball Athletic Trainers Society (PBATS) in 2004. “It was important to get my son here, because I am always stressing to him about making healthy choices,” Cannon said. The Cannons joined a large contingent of youth and parents in the surrounding metro Atlanta area to learn about the importance of a healthy diet, being active, staying fit and the dangers of performance-enhancing drugs. Braves head athletic trainers Jeff Porter and Jim Lovell were on hand to guide the youth through several training stations. 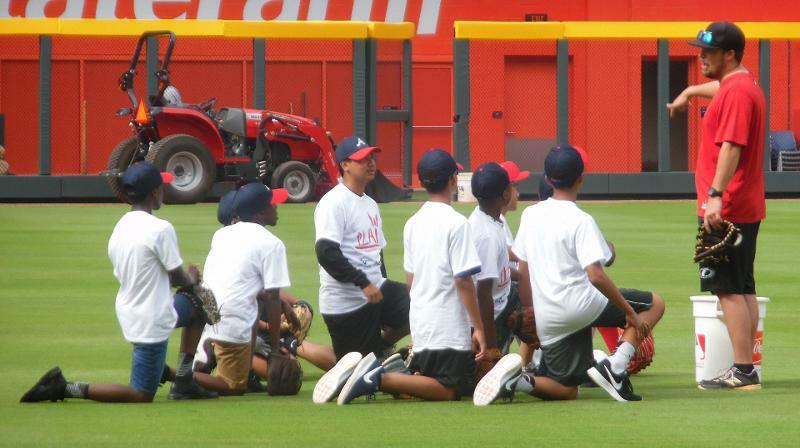 They took the kids through different aerobic exercises and facilitated agility, fielding and batting-cage stations. Braves relief pitcher Jason Motte also made an appearance and spoke on how being active impacts his career. He said that it was great to be around the kids, and he was happy to see them be receptive to the message of staying fit. Many kids enjoyed the experience and were thankful to be a part of the PLAY Campaign at SunTrust Park. They raved about the field and the chance to interact with players and personnel they have grown up watching. Donovan Felton, 16, participated in some of the drills at the event. He was thrilled by the agility session and said that it helped him improve as a player. “I learned a lot with agility and the right stretches so that you don’t have any injuries,” Felton said. “I got a good experience from the Braves organization and how to make right choices to be healthy, be active and to stay fit. The National PLAY Campaign has traveled to all MLB stadiums in conjunction with the Taylor Hooton Foundation and the Henry Schein Cares Foundation to educate youth on health and fitness. It brings awareness to performance-enhancing drugs and the best ways to stay healthier in life. “We want them to know that you can be whatever you want to be all by yourself,” Brian Parker of the Taylor Hooton Foundation said. For Cannon, he thinks that the event helped his son in his daily routine. He believes that this event shed light on making the right choices. “I think I will see a difference in him in the mornings as far as what he wants to do, what he’s choosing to eat and how he is going to do when he is needing to get his rest,” Cannon said.